We tested The Original Porch Pirate Bag for more than 100 days to get a good feel for this package theft prevention tool. The Original Porch Pirate Bag is a cost-effective, convenient way to protect valuable packages delivered to your doorstep. This package bag is an easy-to-use solution to your package and parcel security concerns. Continue reading below for our full review of The Original Porch Pirate Bag. What is The Original Porch Pirate Bag Made of? The creators of the Porch Pirate bag state that it was designed “to deter thieves who have stolen over 26 million packages from American homes and businesses.” Its build quality is certainly sufficiently sturdy to act as a deterrent. The Porch Pirate Bag is manufactured in the United States of America using PVC Reinforced Ballistic Nylon Bag (1000 Denier). This type of fabric apparently is often used as a protecting layer for hoses and cables according to heavydutyfabric.com. The bag is a solid gray color and seems to be somewhat water resistant — much more water resistant than other package theft alternatives like video doorbells and paper notes asking the delivery person to leave the package under the doormat. The weight of the fabric is very thick. It feels like the thickness of a swamp cooler cover or a heavy duty tarp. The bag is also equipped with what appear to be stainless steel grommets for the two points of contact for the lock, one for the zipper lock and one for the cable lock which is used to lock the bag to a front door handle, side gate, porch post, or anything else near your delivery location. The zipper is very sturdy and the zipper pulls smoothly along the teeth, something we think is important for delivery professionals. This bag requires deliverymen and women to take a little extra time on deliveries, so any ease in convenience—even if it’s found in a smoothly zipping zipper—is a good thing. The Original Porch Pirate Bag comes with a triple combo Master Lock (Model 630D) including instructions on how to set your own 3-digit combo. It’s easy to use and provides a good level of security. This lock is what the delivery person would use to zip the bag up after inserting the delivery, then lock the zipper to the stainless steel grommet on the corner of the bag. The Original Porch Pirate Bag also comes equipped with a weather resistant cable and lock to lock the bag to your door, porch column, or anything else near the delivery location. The cable is made by Topzone® and is 26” long, 8mm wide, and has a key lock at its end along with two keys. It’s coated with vinyl to prevent rust and damage. The Original Porch Pirate Bag is available in one size: 30 inches wide by 40 inches tall. The bag expands out to comfortably fit multiple small and medium size packages or one large package. It’s large enough to be challenging not to see by a parcel or package delivery person. The hope is that a delivery person will see the bag—at 40 inches tall and 30 inches wide, it’s hard to miss—insert packages into bag, zip up, and lock the zipper using the Masterlock which will stay locked until you return. To access your bag, simply turn the dials on your Masterlock to your combo, unzip the bag, and retrieve your hard-earned packages. The bag is currently only available on Amazon.com and sells for $34.95. Shipping is an additional $7.50 for a online cart total of $42.45. Should I buy The Original Porch Pirate Bag? The average online order for online shoppers is now more than $80. Purchasing and using the $42.45 Porch Pirate Bag to deter just one costly theft would make sense from a cost perspective depending on how valuable your orders tend to be. In addition to reducing your risk to stolen goods, avoiding the headache of distress of trying to recover a stolen package is also worth considering. The Porch Pirate bag does require minimal work in monitoring orders and remembering to lock the bag near your delivery destination on the morning when expected deliveries will arrive, but some online shoppers might save time by keeping the bag installed for days at a time if they are expecting multiple deliveries. Package theft prevention tools vary in their ability to prevent package theft, cost, and convenience. Determining your preferences and goals with preventing package theft will help you know if The Original Porch Pirate Bag is the best solution for your needs. Package Theft Prevention. 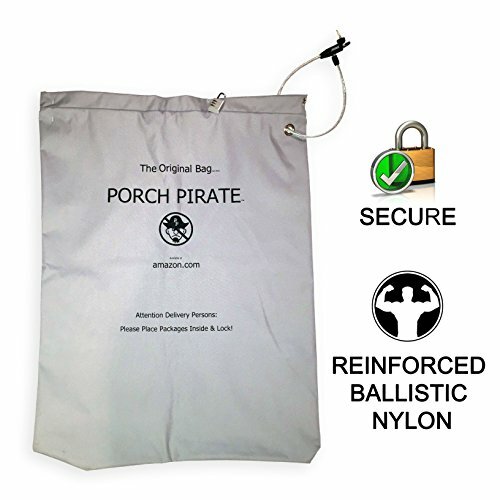 The PVC reinforced Ballistic Nylon material, lock, and overall build quality of the Original Porch Pirate Bag is sufficient to prevent all but the most determined porch pirates. We have yet to see a porch pirate steal a package from a secured porch pirate bag on camera. Perhaps only parcel boxes provide more security and better weather protection, but the added security comes at a higher price. Parcel and package bags like the Original Porch Pirate Bag also do more to prevent package theft than doorbell cameras and other measures. Cost. Using a bag like The Original Porch Pirate Bag is a relatively inexpensive option compared to other package and parcel theft solutions like doorbell cameras, security cameras, dogs, parcel boxes, and fences. Cheaper options may be less convenient like sending your package to an alternative delivery location or scheduling your day around being home when the package is delivered. Convenience. Using The Original Porch Pirate Bag takes minimal—but some—effort each day you’re expecting a delivery. We timed setting it up and it takes about 30-60 seconds to set up and lock to a delivery location and an additional 30-60 seconds to retrieve a delivered package. It also may take effort to train delivery professionals to use the bag if they aren’t used to seeing such devices on their delivery route. Those who live in areas more adversely affected by porch pirates and package theft may have greater success getting delivery professionals to cooperate with using The Original Porch Pirate Bag.